Michaela: With me for this special, in depth review of Little Witch Academia is Jason! We’ll be discussing what makes this show so great, from the characters to the music, the voice acting, and of course the story. I’d say that we’d end the review with a recommendation of whether or not anime fans should watch it, but honestly, that answer is obvious – yes. Yes you should watch it. Fair warning, this review is going to spoil some things about the story, characters, and certain scenes. If you plan on watching the show, don’t read any further if you want to avoid spoilers. Jason: First things first, what’s Little Witch Academia? LWA is a Japanese anime franchise created by Yoh Yoshinari and produced by Studio Trigger. It follows the tale of young Akko Kagari and her friends Sucy and Lotte as they learn and live at Luna Nova Academy, a Hogwarts-esque academy for witches. It was originally a short film created as part of the Young Animator Training Project’s Anime Mirai 2013 project. 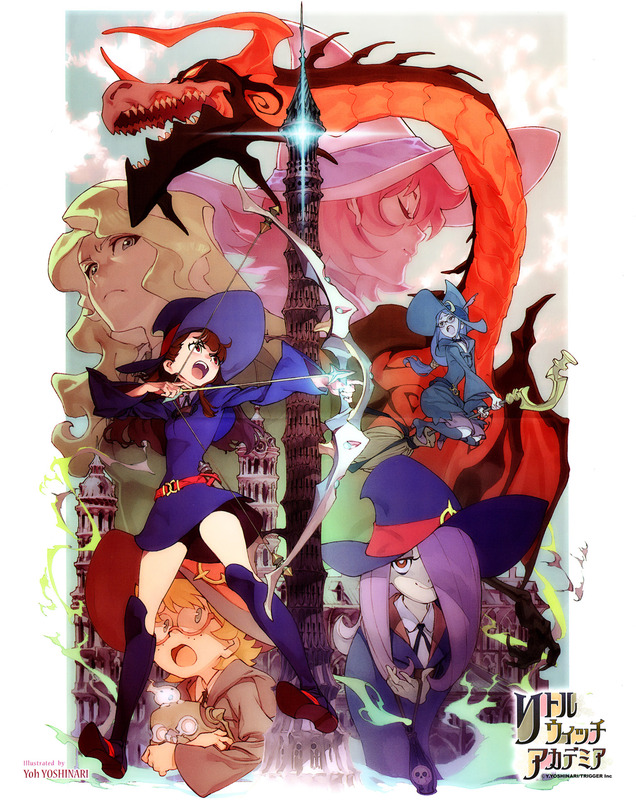 A second short film partially funded through Kickstarter, Little Witch Academia: The Enchanted Parade, was later released in October, 2015. We’ll be talking about the recent 2017 anime television series that you can now find on Netflix! Now before you head any deeper into this review, I have one request: put the OST on in the background. One of the best ways to describe the feeling of the show is, IMHO, through the soundtrack. So assuming you’ve got speakers and can crank some tunes, just click here and continue on! This GIF basically sums up the three main characters: Sucy, Akko and Lotte. Michaela: The characters in Little Witch Academia are arguably the strongest part of the show. Every single one has a unique personality, and the core cast of characters has a major dilemma that they have to deal with in their own way. They’re sympathetic and incredibly flawed individuals that add some realism to an otherwise fantastical premise. Jason: I agree. LWA is a character driven anime and they made sure to deliver on that front. Of course, they also had two short films to work out any of the kinks before they rebooted the world into the series, so they’ve had time to perfect the characters. Real talk though, name your favorite character. You only get one, go! Michaela: One?! Ugh that’s so hard! No fair. It’s a tough call since I love both Chariot and Sucy, but if I have to…it’s Chariot. Sucy is a hilarious, wonderful character and I love her sarcasm and general indifference to everything, but I was intrigued by Chariot’s story from the very beginning. Who was this powerful witch, and why did she disappear? Where did she go? Studio Trigger drops hints pretty early on, and while some fans may have been frustrated that Chariot’s true identity was withheld from Akko until the very end, I thought it was an excellent choice. By having the viewers privy to Chariot’s secrets first, it allows them to sympathize with Chariot and Akko when Akko’s dreams are shattered by the truth. The parallels Chariot and Akko share are emphasized to create an excellent story of dream chasers doing the best they can across two generations. Your turn! Jason: Well I must admit, I was tempted to give Chariot my vote as well! Watching the show a second time, knowing everything I knew, gave me a real appreciation for what Chariot was going through. It was heartbreaking, but I loved it. But I think the honor of my favorite character would have to go to Akko. It might be cheating since she’s the protagonist, but oh well. She gives LWA this sort of energy that you don’t get in many other shows. Sure most heroes are dedicated and work hard towards their dreams, but Akko takes that drive and matches it up with perhaps the greatest lack of skill I’ve ever seen in a main character. Seriously, Akko is pretty terrible at pretty much everything. But that’s why she’s the best! She never gives up and unlike so many shows who try to tap into that “never giving up is my power” thing, LWA got me to believe it. Akko believes in her dreams just as much in episode 1 as she does in episode 25, likewise her magical skills have only just barely improved. But that’s what’s great about Akko and LWA, the things she learns and the growth she experiences can’t be measured on any typical shonen chart! Michaela: There’s a time and place for the typical shonen cliches to rear their heads, but I also enjoy Little Witch Academia for everything it’s not. This show steers clear of boring tropes and cliches in favor of developing strong characters and an exciting story. But now that you’ve brought all of this up, I need to rethink everything about Little Witch Academia, Jason! Do you know how many hours I’m going to be toiling away over these themes now? A lot! Jason: I’ve never been a fan of your typical “hero” anime like Dragon Ball Z or Naruto, which may sound odd considering my love of Gurren Lagann and Kill la Kill, but I have a really hard time getting into stories that equate to “good guy meets more powerful bad guy, good guy somehow gets more powerful, good guy wins,” every single fight. I want characters to suffer, fail and/or die, I want a struggle I can believe! Gurren Lagann throws a lot of psychological damage at their characters, and even Kill la Kill has their main character get bested/beaten rather often; heck one of my favorite episodes in Kill la Kill is when Ryuko has to ride around without her outfit because she’d lost a battle just a few episodes ago! Cue motorcycle rev & Ryuko’s theme music. My point is that LWA isn’t a show about Akko facing a bad guy, somehow getting more powerful, and winning. Akko’s greatest villain is arguably herself, despite the actual villains and obstacles she faces. Sure she learns a lot throughout the show, but she never really gets more powerful; and while everything manages to come together in a happy ending for her, Akko’s life would best be described as a series of wonderful failures. I love everything about it, and her! Jason: This show has perhaps the greatest collection of character expressions I’ve ever seen. The fact that there was a poll of “Best Akko Faces” on the LWA Reddit that totaled something like 980+ entries should tell you something. Michaela: Back when the first short film came out, I remember reading that there was a scene with Akko running from a dragon and reading that it took over 200 frames to animate that one sequence. Studio Trigger is incredibly careful and detailed in their work, and it really shows here. Little Witch Academia’s strengths are definitely the stunning world building as a result of the crisp and colorful animation. Every location is incredibly detailed and unique. But the show is also great at handling motion and action sequences as well – there’s a particular battle that stands out in my mind as arguably one of the best moments in the show, with Chariot fighting off attackers while running up a wall and doing all kinds of magic and acrobatics. It’s exciting to watch and a rare moment of chaotic animation in a show that focuses very little on bombastic action scenes. Studio Trigger is also shameless with its references, and the reference to Gurren Lagann both in visual aesthetic and even the same sound effects was so much fun to watch. Jason: The Gurren Lagann reference episode (18) is my favorite for exactly that reason! Studio Trigger knows how to do action, it’s their forte. So seeing them cut loose every now and then within the confines of a much less frantic show is a true delight. The show also has a wonderful sense of comedic timing that reminds me a lot of Nichijou. That episode in particular has some of my favorite gags! Plus Constanze is totes adorbs! I suppose I gotta ask, what’s your favorite episode? Just my girl Akko. Doing Akko things. Constanze remains unphased. Michaela: It’s pretty tough for me to choose, since your favorite is way up there for me too, but I think my favorite episode has to be with the plot twist involving Akko and Chariot (22). We finally get Chariot’s full story, as well as a deeper look at Akko and her struggles to improve as a witch. So many of the dangling plot threads come together to create a really heartbreaking but powerful scene, and it was so well done. The animation was gorgeous, the raw emotion was palpable, it was so good. Jason: The Music is composed by Michiru Ōshima, who’s worked on everything from the Legend of Zelda and Full Metal Alchemist to some Godzilla films. Pretty good music, wouldn’t you say Andrew? Michaela: Okay, that’s seriously an amazing resume. I had no idea that this composer worked on those projects, and I think that’s a testament to how varied her musical orchestrations sound. It’s fitting to every show and video game she works on, and while a lot of composers can be pinpointed by having a certain style to their music, Oshima isn’t. She’s incredibly versatile, and the fact that you can hear it is really cool. Jason: The music in LWA perfectly encapsulates the jovial, often whimsical feel of what I imagine an all-female Hogwarts would be like. It can be inspiring when it needs to be, playful or devious when the characters are up to assorted hijinx, and downright mysterious or sad when the emotional rollercoaster that is Akko’s life eventually hits that obstacle. Their use of an almost entirely orchestrated soundtrack gives the show a distinctly “European” feel that further emphasizes the non-Asian aspect of the show. It also helps that the show features very little “action” in the typical anime sense. This isn’t a show where characters duel each other to the death to the heart pumping sounds of some high octane rock or techno track, it’s a show where an impulsive girl gets in way over her head and we get to watch her fail in the most lovable ways possible. It’s also a story about one girl and her idol, Shiny Chariot. Akko wants to BE Shiny Chariot, and is often following in her footsteps. It should come as no surprise then, that the one musical theme that works its way into multiple parts of the show’s score is Shiny Chariot’s. It’s heroic, inspiring or tragic; whatever the story needs. There are times it runs the risk of being over-used, but sheer number of different version of the track that exist help dodge that bullet. Michaela: Chariot’s Theme is also my favorite, mostly since it’s been with Little Witch Academia from the very beginning, back when this was a short film. It’s iconic, epic, and befitting of every moment it plays in across the entire show. The whole soundtrack is great, but Chariot’s Theme is the one that gets stuck in my head the most often, and is the song I associate with the show first and foremost. Jason: Despite being “limited” to most orchestration however, the soundtrack does a wonderful job of providing an expansive breadth of sound. Some of the standout tracks, IMHO, are “Woodward”, which provides a very celtic musical voice to some of the show’s scenes. “Magical Festival”, which sounds like it jumped right out of a spooky Camille Saint-Saëns piece. “Trial”, because who doesn’t like some crazy organ? “Incubation”, because it sounds like it belongs in the Forest Temple from Ocarina of Time. And lastly “Magic (Excited)”, as it provides Chariot’s Theme with the kind of pomp, circumstance and (yes) excitement that seem to perfectly sum up Akko in one, singular track. Michaela: Slightly unpopular opinion incoming, but I didn’t love the English dub. There were some voices that I thought were well suited to the characters and perfectly acted, such as Sucy, Croix, and even Andrew. Maybe it’s because I got the Japanese voices from the films stuck in my head that the English ones sounded jarring, I don’t know. But it didn’t stand out to me as an excellent dub, like other series such as Fullmetal Alchemist Brotherhood. Despite that, the English dub succeeds in hitting the emotional moments when they count, as well as having a solid translation. Don’t love the dub?! How dare you! Jason: Oh I’m certain there is a legion of anime purists to back you up there Michaela, so don’t worry. Being the uncultured scrub that I am, I’ve actually never seen/heard the Japanese version of the show or movies! I’ve only ever watched the English dubs and absolutely love them. Akko, Diana and Chariot in particular, stand out to me as perfectly acted. Diana sounds haughty or humble when she needs to be, Chariot can be fiery and full of passion one moment before playing dumb the next, and Akko is the boisterous, hyperactive ball of energy I expect her to sound like. I’ve no idea how it holds up against the Japanese voices, so my opinion is limited here, but I’ve never been disappointed with the dubs. In fact, LWA has some of my favorite voice acting from non-big name voice actors. Michaela: It’s true that a lot of the voice actors (at least in the English dub) aren’t big names, and I do appreciate that the industry is growing beyond the main ten or so voice actors typically cast in anime in favor of bringing in new blood. It’s a nice change of pace from the standard, and that alone is reason enough to watch it. 1. Akko is the typical, clumsy girl who works hard for her dreams and will do anything to achieve them. 2. Luna Nova is a magical school for witches, and a lot of time is spent on learning new spells, how to fly on a broom, and so on, not unlike Harry Potter. While this show DOES have these moments, the story goes out of its way to balance the narrative so that these features don’t become too overbearing. Akko learns how to become a better witch, but that doesn’t stop her from seeking adventure in the strangest of places either. It feels less like a slice of life anime and more like an adventure anime, which is perfect for the fantastical world of Little Witch Academia. Later on, the episodes expand on the lore of their magic beyond the confines of the school, and in doing so, reveals Chariot’s backstory in small clips. The viewers get the full picture later, but by having these moments of showing Chariot in the past and having Akko being more infatuated with being like her, it makes the reveal at the end all the more devastating for her. Speaking of devastation, that twist with Akko? I did not see that coming. So good. Jason: I cried. I was not expected to be punched in the feels like that. Pictured below: me. Michaela: I felt so bad for her! It was such a sad and powerful scene. Which brings me to my next point: Little Witch Academia perfectly balances comedy, drama, mystery, and wonderment to tell an exciting story that, as per the tradition of Studio Trigger and Studio Gainax, escalates and has pretty high stakes by the end. The only flaw I have with the pacing of the show is how quickly Akko begins to learn the words; in the early episodes, she only learns two, and within the last six or seven, she learns the last five pretty much back to back. I can’t fault Studio Trigger for pacing the story this way, as the intrigue or search for the words isn’t quite as important in the long run, but I did wonder about it all the same. Jason: LWA is, at it’s core, a story about failures; by which I mean people who fail at things not the events themselves. Akko, bless her heart, is not a successful person despite how desperately she wants and dreams to be. Diana, despite all her talents and privilege, was not chosen by fate to be the one to accomplish the goals she has put before herself. And Chariot, poor Chariot, not only did she fail in accomplishing her dreams but her failure actually hurt the people she wanted to help. LWA is not a story about people who succeed at every task they put their minds or skill sets to. Yet in the end, together, each and every character does succeed at getting what they wanted, just not in the way they thought they would, and not alone. Michaela: And while part of the show’s message is about friendship and being stronger together, it’s not too overt like it is in so many other ones. Here, it’s only part of the core message, that while our failures may be painful, as long as we stay close to our friends and allies, things will be brighter and better in the end. It’s a relief to see a show take on a new message and core themes while still throwing a nod to some of the more traditional ones often seen in anime over and over again. Believe in the me that believes in you? Jason: I feel I should take a second to touch on what I feel is one of LWA’s greatest strengths: it’s use of Chariot and the lesson it teaches about the passing of the torch from the old guard to the new. We live in an age when countless so called “millennials” have gone off to college with stars in their eyes and a dream in their heart, only to finally enter the real world and learn that none of what we thought we would get out of life would be there. Is it our fault for having high expectations? Maybe, but that isn’t really what I want to talk about here. What I want to talk about is that feeling of failure that many people my age feel when they walk away from college with a degree and quickly realize that all that time studying and learning and working towards your “dream” pretty much amounts to… nothing. This brings me to Chariot. Chariot lived her life, worked for her dream, and shot for the moon (literally). In the end though, it didn’t matter. She never figured out the final word, and even the hope and inspiration she nurtured in the hearts and minds of the next generation was undone by the irreparable damage she caused them while doing so. Despite all her intentions to make the world the best place and live her dreams, she failed in every aspect of her life. That is not, however, the end of Chariot’s story. She continues on, becomes a teacher, and does her best to make do with the life she’s been given. LWA might be Akko’s story, but that story couldn’t be told without Chariot. Chariot, for both good and ill, is a major player in Akko’s story and I personally find a great deal of beauty in that. Chariot might have failed in every way possible, but those failures put her in a position to finally see her dream come true. The Rock (Yes, The Rock) once said that being kicked off his professional football team was “the best thing that never happened for him”. I think there is a great deal of wisdom in that statement, as well as in Chariot’s character arc in LWA. Chariot’s past failures and ultimate success speak directly to a generation of people like myself who often wonder if we’ve simply missed out on accomplishing our dreams of if perhaps, like Chariot, our failures will turn out to be the best things that never happened for us. In the end, I guess the best thing any of us can do is just believe in ourselves and do our best to make the life we have into the dreams in our hearts. After all, Believing in yourself is your magic. Great review you two! I was already considering this for my list of things to watch, but now you guys might have bumped this further up the top. The themes and characters already sound like this would be up my alley.